Ulsan, Korea – October 21, 2013 – Songwon Industrial Group (www.songwon.com) is dedicated to sustainability which is clearly demonstrated in how it is meeting or exceeding stringent environmental and health & safety regulations and initiatives. This is being driven by a commitment to produce and sell products that use less of the Earth’s resources and which can be safely used by the value chain. Songwon’s global customers can continue to meet their environmental and health & safety goals, being ensured that they do not only use products that meet all these regulations, but will also receive expert support on the complexities of compliance, registration and certification. Jongho Park, Chairman and CEO and Head of the Songwon Industrial Group Executive Committee, stated: “Sustainability, as well as health & safety, is interrelated with other key performance metrics such as innovation and operational effectiveness. The chemical industry and its value chain continue to face new challenges regarding chemical control legislation to ensure we all live and work in a safe and healthy environment. REACH* is one of the most comprehensive and complex regulatory initiatives to date. It has increased awareness and raised the bar on the level of chemical control and, in doing so, it has stipulated other regions to take a similar approach. 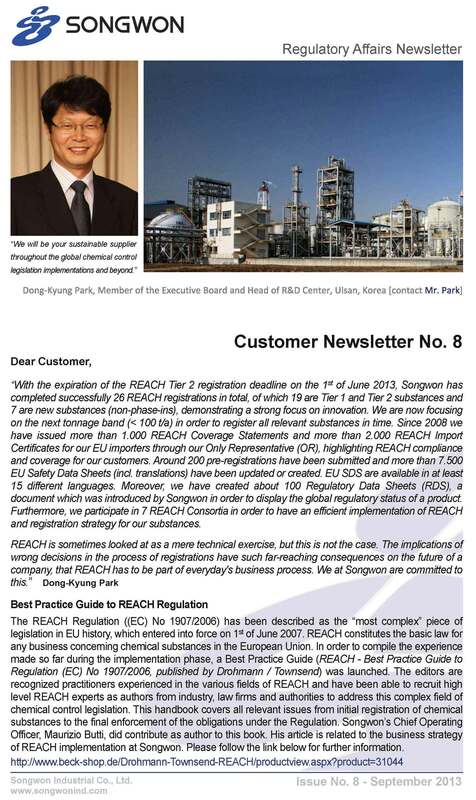 Songwon provides extensive information to its customers through a newsletter, on the REACH processes, requirements, deadlines developments and achievements. Regular updates are communicated on the substances registration process and customers can proceed with their business, understanding that Songwon’s products will be 100% compliant within the REACH deadlines. Chemical control legislation, such as REACH, is rapidly migrating to other regions; most recently Asia, which is driving growing demand for regulatory affairs competence in the region. To meet this demand Songwon entered into a co-operation with Chemservice S.A. based in Luxemburg, a company with outstanding experience in regulatory affairs and international chemical control legislation, based on a substantial network and knowledge of the chemical industry and its related value chain. Chemservice Asia combines global regulatory affairs expertise together with EHS skills and chemical process competence. The goal is to be a strategic partner for the chemical and polymer related industry in the Asian region by identifying opportunities to gain competitive advantage through regulatory processes.Songwon has embraced REACH since its inception; it is now well established and its implications are far reaching and are part of everyday business. Songwon has successfully completed 26 REACH registrations in total, of which 19 are Tier 1 and Tier 2 substances and 7 are new substances (non-phase-ins). Since 2008 Songwon has issued more than 1.000 REACH Coverage Statements and more than 2.000 REACH Import Certificates for Songwon‘s EU importers. 200 pre-registrations have been submitted and more than 7.500 EU Safety Data Sheets have been updated or created in at least 15 different languages. 100 Regulatory Data Sheets (RDS) have been created – a document which was introduced by Songwon in order to display the global regulatory status of a product. 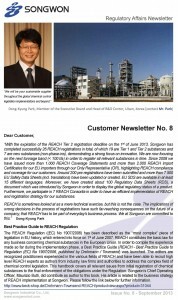 Songwon participated in 7 REACH Consortia in order to expedite its implementation and the registration of our products. Songwon is available to further discuss REACH and regulatory affairs at K 2013; Stand C79 in Hall 6.